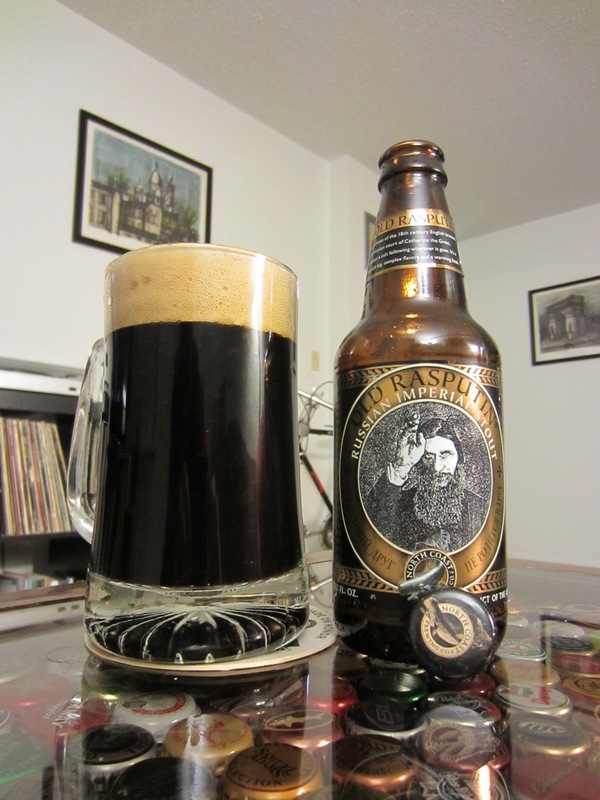 It's no hyperbole to say that Old Rasputin, named for Grigori Rasputin, is a dark beer. An extremely dark Russian Imperial Stout, indeed. Only a feint ruby glow emerges around the edges of the glass. The large, frothy tan head of foam is creamy and pocked by large bubbles of carbonation. The beer's retention is excellent and leaves layers of lacing all the way down the glass. A mild smokiness emanates on the nose with a slight alcoholic sweetness. Massive dark roasted malts seem to mimic chocolate-coated candied fruits. The body and mouthfeel of the beer are substantial, but very slick with very minor effervescent carbonation that manages to lighten this very hefty beer. Alcohol is strong and prevalent, but the beer isn't boozy in the least. A tinge of heat mixes with and seems to melt the caramel sweetness underlying the roasted grains. Earthy chocolate notes are reminiscent of raw cacao and accent a minor smokiness making for an inviting, but challenging Imperial Stout.